This campaign is created to address the 2 tactical gaps between Red Bull’s current identity and Red Bull’s current image as mentioned in Assignment 3. Positioning: Red Bull is an energy drink that is suited for all aspects of lifestyle of the crowd – people who are fun, happening and risk-takers. 1) To increase breath of awareness of usage situations for study and work. 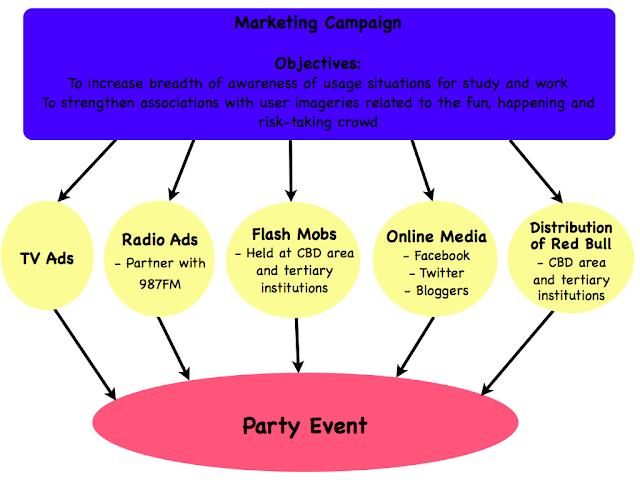 2) To strengthen associations with user imageries related to the fun, happening and risk-taking crowd. To position Red Bull as a lifestyle drink for the extreme crowd, the campaign has adopted the slogan: “Wiings from day to night.” This slogan encapsulates the idea that Red Bull is not only suitable for consumption during the day at school or work but is also relevant for the night life activities that the target consumers engage in. In order to achieve the two campaign objectives, the marketing program will integrate several marketing communication tools which include TV advertisements, radio advertisements, flash mobs, online media and free distribution of Red Bull drinks in selected locations. 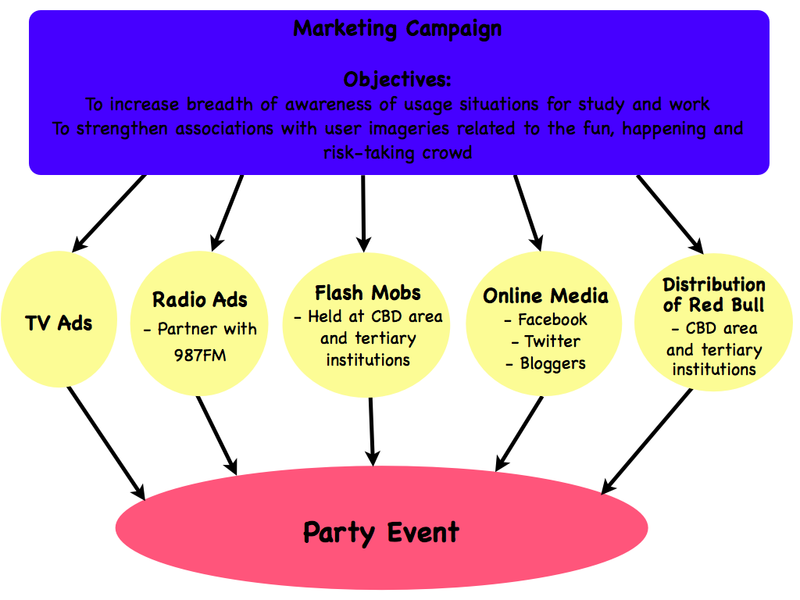 These tools will also promote the culminating party event of the campaign: “The Red Bull Secret Party”. The campaign is planned to last for one month and all marketing communication tools will be used simultaneously during this period.